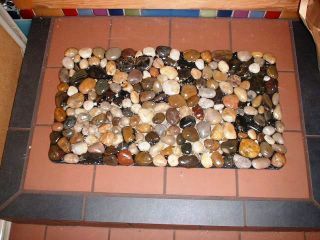 River Rock floormat I made for Mom & Scott. I saw this on craftster around xmas time, and decided to give it a whirl. After I was finished, I sprayed it with acrylic to make the rocks very smooth and give them that super pretty under-water look. It fit perfectly in my mom's sunroom, which has a hand-made mosaic theme she is doing herself. The rocks feel wonderful under your bare feet- especially after they warm up in the sun. Very important to use the right adhesive! In my case, it was difficult because my ma has chemical sensitivities and allergies to watch out for. The acrylic spray I used was a mild florist's spray rather than the haevy-duty crap I like best. I tried a variety of adhesives until I found a good landscapers' adhesive. I also filled in some areas with glue mixed with glossy black paint so it would have a grouted kind of look without me having toactually grout the whole thing. It weighs about 30 lbs, too. Yikes!